Under the deep blue sky of Brazil's central plateau, Brasília was built in two thousand days to be the nation's focus of power. Inaugurated by ex-President Juscelino Kubitschek on April 21st, 1960, the Brazilian capital is the best known of the cities that were planned during the 20th century and is a landmark in contemporary town planning and modern architecture. The major players in the history of Brasília were ex-President Juscelino Kubitschek, who launched the competition to select the project for the new city and made huge efforts to see it built during his term, the town planner Lucio Costa, winner of the competition and creator of the Pilot Plan for Brasília and the architect Oscar Niemeyer responsible for the city's main architectural works. Although it has been in existence for just under forty years, Brasília is the result of long-standing dreams. In 1823, its name had already been put forward by José Bonifácio to the General Constituent Assembly of the Empire which was considering installing the Federal Capital in the Brazilian interior. As well as being that visionary's dream, the Brazilian capital was also inspired by the prophecy of a saint: in 1883, Dom João Bosco, a Salesian priest living in Turin, Italy, revealed that a new civilization would emerge in the centre of Brazil, somewhere between the 15th and 20th parallels. The new Federal District attracted workers from all the regions of Brazil; these were the so-called "candangos" (labourers) who were responsible for the building of the city. Twenty seven years after the inauguration of Brasília, the efforts of the thousands of workers involved were recognized by UNESCO when the city was declared as being a Heritage of Mankind in 1987. Situated in the Centre-West region in an area ceded by the state of Goiás, Brasília is bordered by the Rivers Preto to the east and Descoberto to the west, bringing together in an area of 5,822 km2, a population of 2 million inhabitants. Livings together democratically in the city's squared configuration are politicians of various persuasions, diplomats from the most far-flung countries and civil servants of all ranks. However, the fact of their living together does not remove the contrasts: the satellite towns where thousands live are advancing in a disorderly fashion around the Pilot Plan with its broad, tree-planted spaces, the distant horizon, the north and south lakes and the succession of arches and curves that form the architecture of the city. The visitor to Brasília cannot miss visiting the Esplanada dos Ministérios and the Praça dos Três Poderes, location of National Congress (seat of legislative power), the Planalto Palace (head quarters of executive administration) and the Supreme Federal Court (judicial authority). These are often the subject of picture postcards that together with the Alvorada Palace, the Metropolitan Cathedral, the Palace of Justice and the Itamaraty Palace, amongst other buildings, have become tourist attractions. As a complement to the beauty of the architectural landscape, Brasília contains the highest concentration per square metre of works by the best-known Brazilian artists. This high density of works of art is on display in the gardens designed by Burle Marx which lend beauty to the official buildings; they take the form of statues by Ceschiatti, panels by Athos Bulcão, Di Cavalcanti's mural and Bruno Giorgio's sculptures which adorn the public buildings. Centre stage for Brazil's major political decisions, the Federal Capital also has 24 museums that tell its own story and trace Brazil's course through history. Most notable amongst these museums are the JK Memorial Museum, the Catetinho Museum, the Museum of the Indian and the Museum of North-Eastern Arts and Traditions. Much more than just a parade of palaces and works of art, Brasília is also a magical discovery because of the beauty of the natural world that surrounds it - the cerrado (scrublands) with its twisted trees, the hidden waterfalls, grottoes, lakes, natural swimming pools, caverns and nature trails that constantly surprise the visitor with their rare species of fauna and flora. A total of 42% of the territory of the Federal District is of environmental protection areas. Amongst these natural attractions is the Brasília National Park which includes the basins of the Rivers Torto and Bananal with landscapes formed by open country, scrublands and ciliary forests, as well as two mineral water swimming-pools with excellent supporting services. It is an environmental reserve with a museum containing local species of fauna and flora. A little further away from the centre of the Federal Capital is the Poço Azul ("Blue Pool") with its clear blue waters forming a pool contained in a rock of quartz; there is also the Mumunhas waterfall with its natural swimming pools and rocky profile. Both of these are situated in the Cafuringa Environmental Protection Area which contains a total of nine caves and grottoes. Capital of Brazil since its inauguration in 1960, the construction of Brasília was determined by the President of the Republic, Juscelino Kubitschek in 1956 and is now registered by UNESCO as a world heritage site. A national contest was held to decide on the design of the new city and the jury consisted of the Englishman, William Holford, the Frenchman, André Sive, the Greek, Stamo Papadaki and the Brazilians Paulo Antunes Ribeiro, Horta Barbosa, Israel Pinheiro (chairman) and Oscar Niemeyer, the architect responsible for the city's main architectural works. Lucio Costa was announced the winner on March 16th, 1957, and the other qualifying designs were those submitted by the teams formed by B. Milman, J.H. Rocha and Ney Gonçalves (in second place), Rino Levi and associates and M.M.M. Roberts (joint third place). The design submitted by the team of young São Paulo architects, which included Joaquim Guedes, contained ideas and forms that were similar to those of the winning entry, evidence of the importance of road axes and a linear structure in the definition of contemporary town planning. The draft scheme submitted by Lucio Costa was in the form of an aeroplane or a cross; the wings (north and south) consisted of a road axis with lateral axes (east and west) incorporated and bordered by multi-family units in large squares, formed by rectangular blocks of six and three floors, intersected by streets for businesses and premises for schools and leisure activities. The complex of the four large squares was called the Neighbourhood Unit, as it contained residential and every day facilities. On the smaller arm of the cross or the aircraft wings, the local and federal government offices are arranged in regular rows, comprising the Esplanada dos Ministérios, grouped around areas at the poles to create the Praça dos Três Poderes occupied by the federal government, the Paço Municipal in the Praça do Buriti. The unusual structure of Brasília Cathedral, adorned inside by an imaginary nun designed by the sculptor Alfredo Ceschiatti, lends emphasis to the surrounding paved area with a back-drop consisting of the monumental domes of the National Congress. 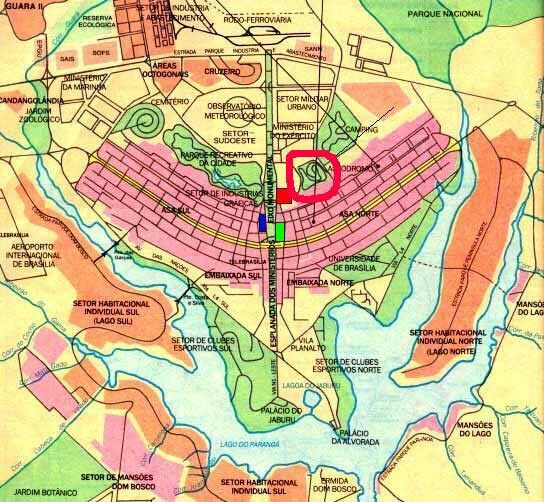 In this immense area, where the sign of the cross is expressed in a directly symbolic way according to the rules laid down by Lucio Costa in the explanatory notes accompanying his initial sketch, the buildings of the different government departments are intermingled with areas concerned with business, leisure and public transport. The areas designed to accommodate this mixture of functions are located at the intersections and consist of theatres, shopping centres, banks and roads. The areas where the embassies and the University of Brasília are situated are an excellent example of Brazilian and international architecture and house centres of advanced research in various disciplines. Facing the vast artificial lake to the east of the city, these areas are also occupied by clubs, parks and housing. The recent use of the lakeside for highly sophisticated shopping and recreation is a move towards making Brasília a tourist attraction as well as being a political and administrative centre, expanding the potential for the development of the Centre West in accordance with the objectives of the then President Kubitschek.